Final Concert of the season and Year. So after the premier on Sunday, we have second performance this evening. I feel fortunate to have had so many nice personal comments since the last performance and to have so many people especially coming to see the show, so thank you for that! . I can't say it's an easy sing, it's never going to be a role where I feel I can relax. Ever page holds a new 'high note' horror, but it is gratifying to feel one can get through that sort of thing. It's a challenge. tonight is the general rehearsal of our production of Rameau Zoroastre at the komische oper Berlin. 6 performances starting on Sunday. Just arrived home to find a little present waiting for me. 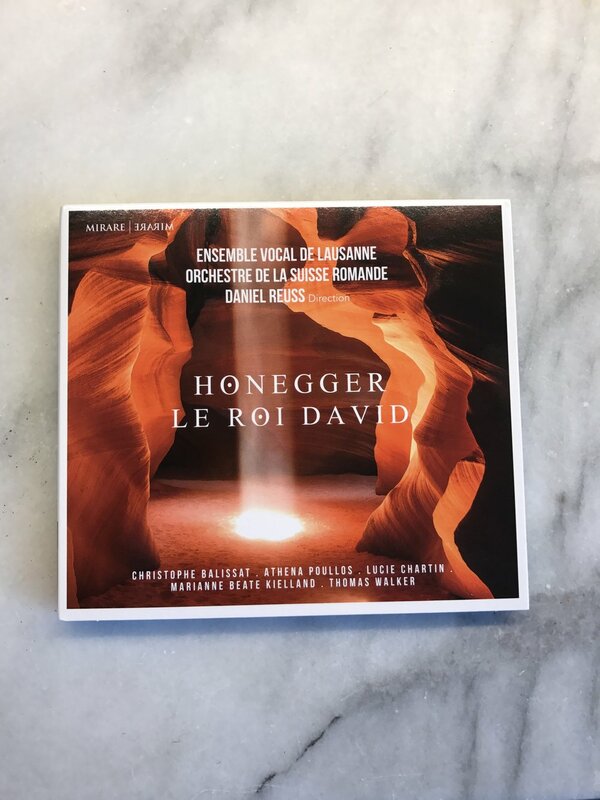 New CD of Honegger Le Roi David, with conductor Daniel Reuss, ensemble vocal de Lausanne and orchestre de la Suisse romande. 8 concerts done, 8 cities, 3 countries and a load of travelling. Passion time is always crazily busy, but this one was spent with exceptional people, everyone always so positive and eager to sing/play their hearts out in the concert. I won't forget this tour for a long time, so thank you to the orchestra, choir and my fellow soloists. Heres a little post concert photo from the final concert last night. So tonight, Mozart Requiem, and Solemn Vespers in Oslo cathedral as part of the Church music festival with Dunedin Consort. First time performing the choruses and solos for these pieces, but it's always great to feel part of the complete picture. Increasingly groups do small forces performances, where to soloists sing the chorus too, and I really enjoy it. Oslo is showing us her best today, glorious spring sunshine, and the possibility of northern lights tonight! So our ulisse comes to a close this evening in Vienna. It's been a marvellous time with great colleagues! This afternoon is performance 3 in Amsterdam Concertgebouw of Il ritorno d'ulisse, then onward to cologne straight after the concert. Tonight is the first performance of our semi staged ritorno d'ulisse in patria. It's been an intense couple of weeks rehearsal, and here's hoping for a great show for everyone tonight. A great week spent in Saint Paul Minnesota. . Revisiting a well known work with colleagues old and new, for me, the 'messiah' never gets old, it's a brilliant piece! our maestro, paul mcressh took us through it in record time with loads of energy., I think we shaved 10 minutes off performance two! That's some serious coloratura ! Today is mostly filled with this gem of a work. It's been a while since I sang this high lying,haute-contre type role, and gosh it's seriously high! Especially with a modern orchestra. I've been singing broader roles of late, so it's good to come back to this. Vocal variety i think is important for me, it helps to keep my voice in good shape. With all the different repertoire I have to work at my technique, which is no bad thing, also looking at the production I'm in a dress and heels, so immediate crash diet, which is also no bad thing. Yesterday I was tweeted a link to our Beethoven Missa Solemnis concert in Utrecht, but not only the radio link, but a video. So here it is for those interested. A radio broadcast on Friday 21st October at 20.00 of our recent performance at Utrecht Vredenburg of Beethovens Missa Solemnis with Orchestra 18th Centuary, Capella Amsterdam, soprano Carolyn Sampson, Alto Marriane Beate Kielland, Bass David Wilson Johnson and yours truly on tenor, all conducted by Daniel Reuss. Now enjoying a little break in sunny Seville after a fantastic tour with this lovely bunch, and of course Capella Amsterdam, Orchestra 18thCent and Daniel Reuss. Very early start this morning to get here, but now enjoying my first glass of cava of the holiday! Long may it continue. Life is full of contrasts, lucky me.